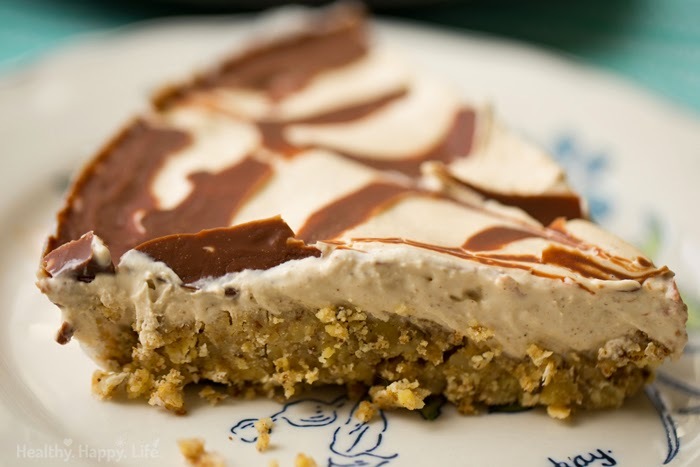 Raw Vegan Walnut Cream Pie with Chocolate Swirl. 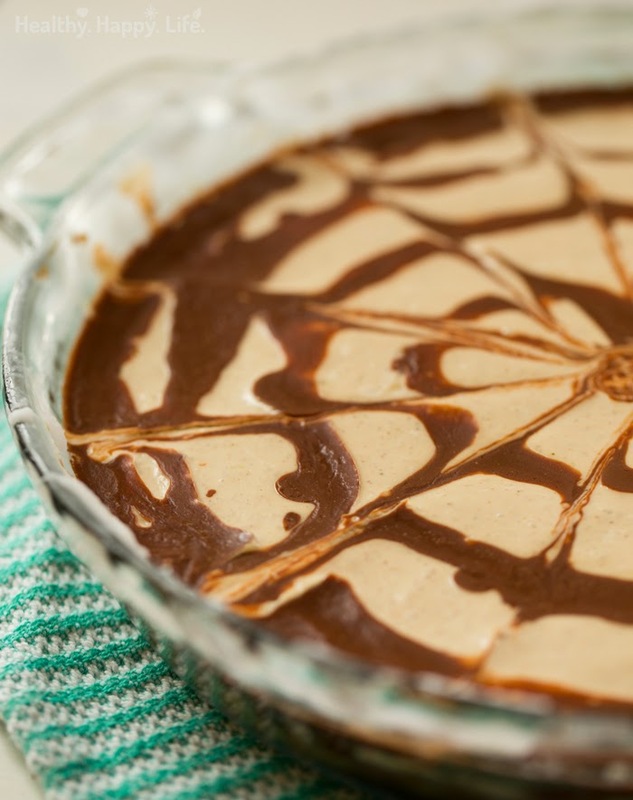 No-Bake Dessert! 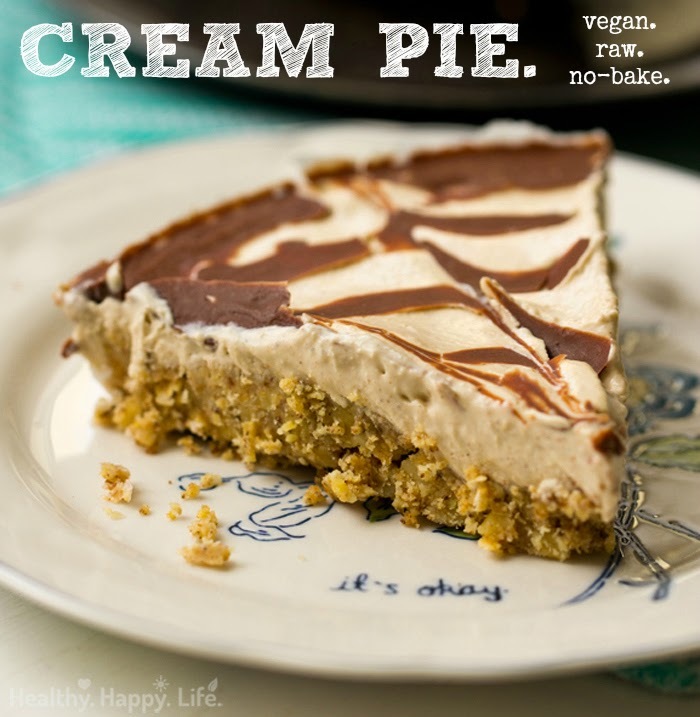 You look like you need a little more cream pie in your life. Am I right or am I right? 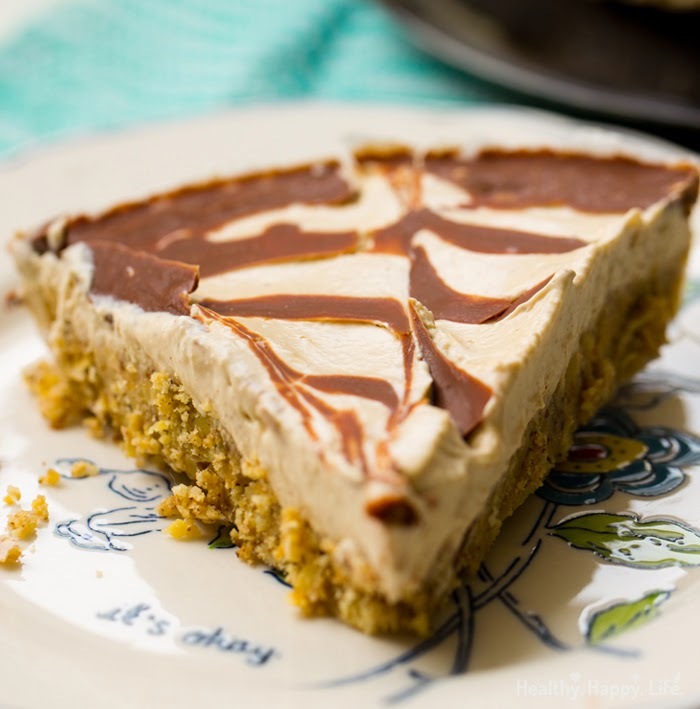 Well if your eyes got all wide and sparkly when you saw these cream pie pics, then you can most certainly hop into the kitchen and scurry to make this easy, no-bake. 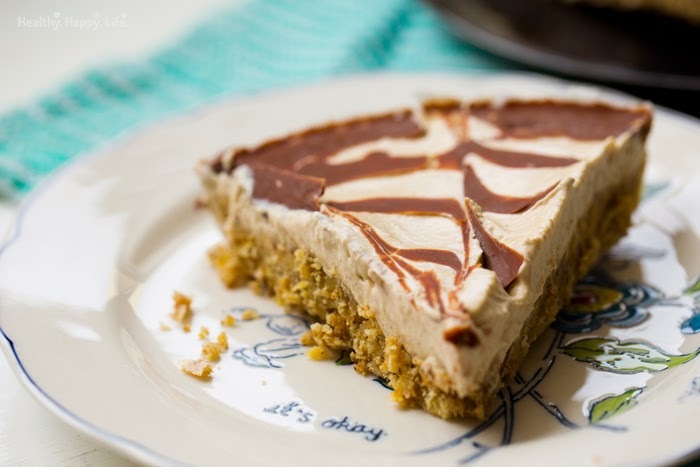 raw, vegan dessert. Seasonal Schmeasonal. This started out as a spiderweb cream pie (the chocolate swirly design on top) but it ended up just being a stand alone amazing cream pie that really needs no seasonal attachment or introduction. I think this cute pie would laugh in the face at anyone who called it seasonal. In fact, this pie is a recipe you could whip up any month, any day, any hour, and feel gosh darn amazing about it. 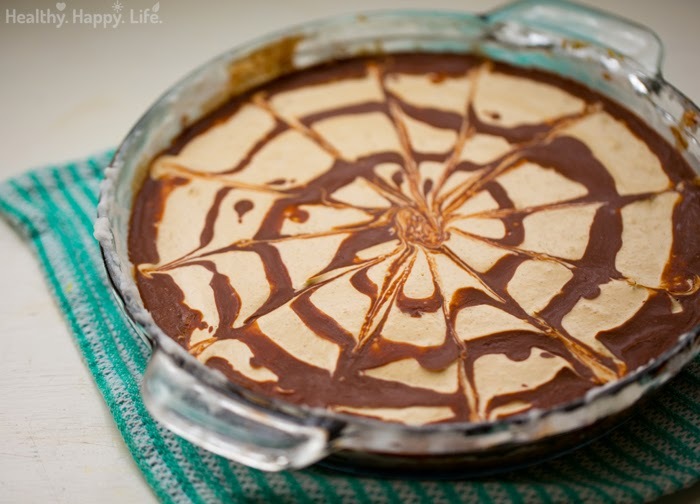 But ok yes, the cute spiderweb design with the chocolate on top does make this recipe fun for fall. 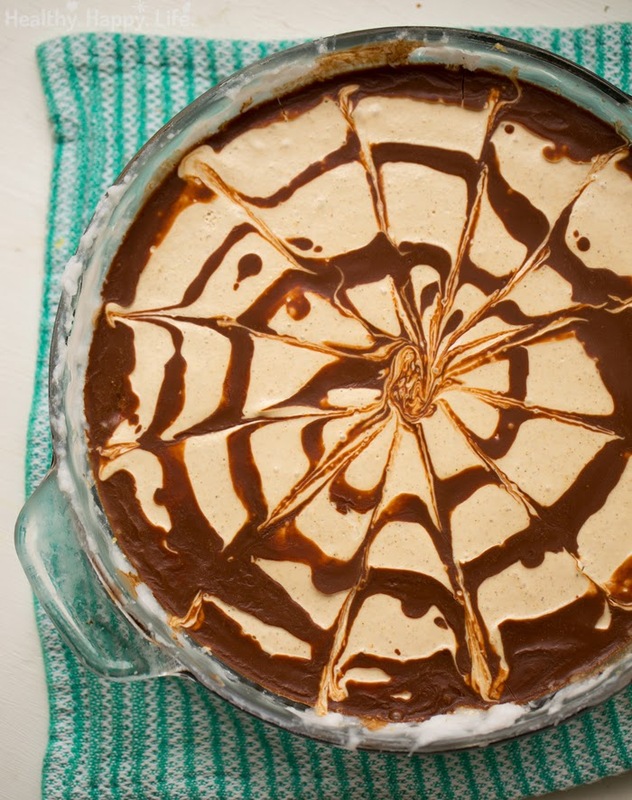 And fall seasonal-ness gives you a nice excuse to make this pie. Ya know, because you need to add some fall festiveness to your September and October and so on. Healthy goodness! 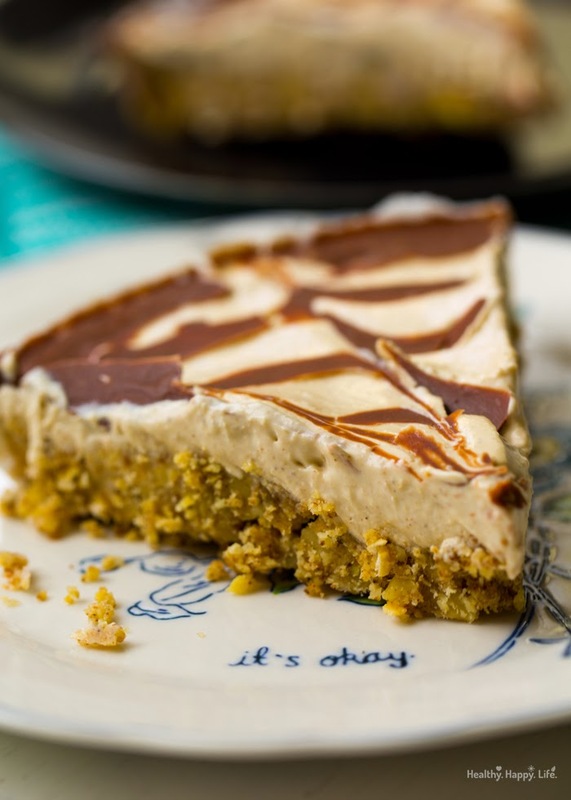 This pie includes healthy walnuts, virgin coconut oil and even some fiber-ful rolled oats in there. Feel good dessert! 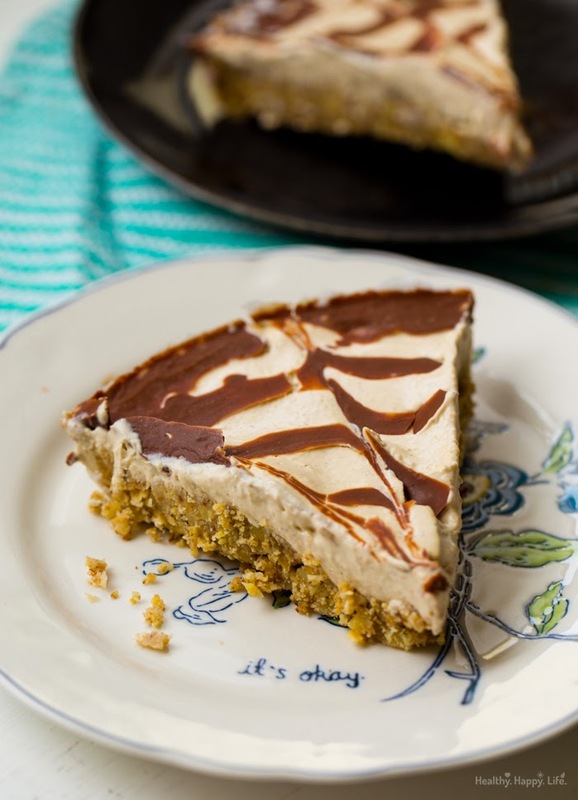 No-bake raw vegan coconut walnut pie with a walnut oat crust. In a blender or food processor, blend the walnuts and oats until a fine crumbly mixture forms. Pour this mixture into a large mixing bowl. To the bowl, add the remaining crust ingredients: coconut oil, salt, cinnamon and maple syrup. Fold until the mixture becomes thick and pliable, like a dry cookie dough. Grease an 8" pie dish with coconut oil. Then spread the crust along the bottom of the pie dish. Set aside. In a blender, add all the filling ingredients and blend until silky smooth. It is ok if the chilled coconut cream melts a bit, it will just re-firm up when chilled. Pour the mixture into the pie dish. For the chocolate, malt the chocolate chips and the coconut oil together and stir until silky smooth. Use a microwave for easiest melting. Stovetop is your next option. Swirl the chocolate over top the walnut cream filling in one big spiral. Then using a toothpick or a butter knife, glide from the center of the spiral outwards, continue all the way around. You can swirl a second time by going in the reverse direction with the toothpick or knife. Place the pie in the freezer for about 30-45 minutes. Or until the pie is soft and fluffy, yet chilled enough to slice. The key to the texture is to chill it to the perfect amount. If you over-chill and it is too hard, simply leave it out at room temperature until softened.